That is awesomely fantastic, Francesca! That's quite the world and that's quite a map. Gorgeous as usual ! I'm Gonna Tell the Spanish, They are Gonna have a "Friendly" Visit on Those Continets, And Maybe Make some "SMALL" Colony's. And Also "HUG AND GIVE GIFTS" For the Natives. A lot of moons! Gorgeous map and great frame design, as usual. Absolutely incredible. One of the most beautiful maps I've seen this year. Incredible. So many details to look at, such a wonderful color palette. Love it. That's so exellent executed! Such maps are like a wonderful dream! 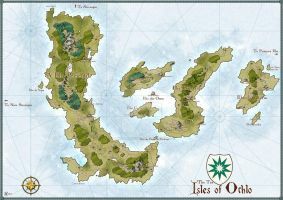 Do you ever made some maps that can be bought as a print? Your map designs are breathtaking. So many details. You're the true master of your craft.